One of the great unsung heroes of soul music Little Buster never got his dues when he recorded in the 60s, but thanks to a couple of CDs from the 80s on, this excellent vocalist and songwriter finally got the attention he deserved. A large percentage of his songs came from his own pen, and all of them featured his throaty, hoarse tones, just what makes the music so special. Edward Forehand was born on 28 September 1942 in Hertford, North Carolina. His blindness caused him to attend the special North Carolina School for the Deaf and Blind in Raleigh until he was 16 and although he learned piano and sax as well, he was already noted as a guitarist of some ability in his early teens. His vocal talent was nurtured in local churches and he recalled listening to artists like Gene Allison, Lloyd Price and Bobby Bland on jukeboxes. After leaving school he formed a duo with percussionist Melvin Taylor in Philadelphia, but left that city for New York when a promised recording deal fell through. Forehand - who had acquired the "Buster" tag in his youth - moved in with his sister in Westbury, Long Island and started playing the clubs there in '59. covering hits by Solomon Burke, Wilson Picket, Sam Cooke and other soul giants of that era. Things began to look up when he won $750 top prize in an amateur talent contest at the Apollo sponsored by the Tip Top bread company around '64. He and friends Henrietta and David Buchanan performed their own composition "I've Got Tears In My Eyes" billing themselves as The 3 Heartbreakers. Fire's Bobby Robinson suggested a record deal, but wanted Buster to finance the session. As an alternative to this kind offer they were referred to Steve Blaine, son of Jubilee's owner Jerry. Busters recording career commenced in August 1964 when he cut a session for Steve and Mickey Eichner at Jubilee's own studio. 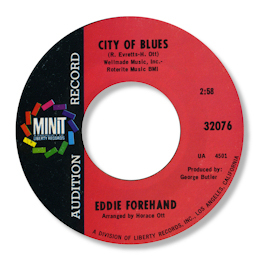 This yielded his debut 45 Looking For A Home released at the end of that year. Although it did respectable sales, from a perspective of over 40 years later it's an astonishing disc. Accompanied by only his own subtle guitar, bass (Val Thomas) and brushed drums by Melvin Taylor, Buster's voice soars and swoops around his haunting lyric. Clearly influenced by Sam Cooke in his phrasing, Busters much hoarser tone lends the song a completely believable cry from the heart. The flip, a version of Percy Mayfields's classic blues ballad "Rivers Invitation" featuring some excellent guitar choruses, fits the mood equally well. From a city noted for its big productions, it was one of the most sparse discs offered for sale at the time. As a result of the 45 Buster landed a 10 day run at Philly's famous Uptown Theatre, backing such names as the Temptations, Mary Wells and the Four Tops. Top Philly DJ Georgie Woods even used "Looking For A Home" as his theme tune for a while. From the same session came his second single, the similarly styled I'm So Lonely which came out in March 1965. Now rightly regarded as a deep soul classic Buster's interpretation of his own desolate words are, if anything. more affecting than his first release. 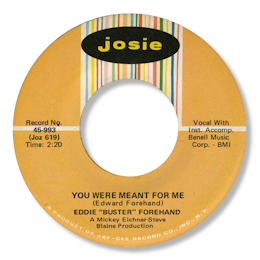 The B side, another Forehand composition, "You Were Meant For Me" makes a quartet of wonderful ballads. I Knew It All The Time which appeared in the middle of 1965 was a great New York soul ballad on which Buster gave his most impassioned and uninhibited vocal to date, screaming and tearing the words deep in his throat. He'd clearly been listening to Wilson Pickett! The other side, "TCB" was a soul stomper in the great tradition, with a tasteful Buster guitar solo. These sides were arranged and produced by the veteran Sammy Lowe. whom Buster said was a great man to work with, and were designed to provide Buster with a much more orthodox background for a soul 45 of the time. They succeeded brilliantly. For the next session in February '66 Buster was flown to Memphis to see if a little Southern magic would rub off. Production was handled by James Shaw and the arrangements at the Sun studios were marshalled by trumpeter Bowlegs Miller, who brought an even fuller sound. But the quality of the material remained as high as before. "Good Thing Going" his next 45, which appeared in the spring of that year is a case in point. An uptempo stomper, it was matched by Busters revival of Rufus Thomas' warhorse "All Night Worker” later that year. But the other sides were first class as well. It's Loving Time is superbly crafted country soul in the classic 12/8 format with tasty tinkling piano. And I Think I'm Falling is a marvelous blues ballad. Buster's final singles for the Jubilee group came out on Josie subsidiary and the session for them was back under control of Mickey Eichner, with Herb Bernstein handling the arrangements. The first output of this was a straight horn laden recut of Clarence Frogman Henry's smash "But I Do" released toward the end of 1967. This was followed early the next year by another terrific effort, an impassioned version of Young Boy Blues, a deep ballad of great force with a sympathetic backing of keyboards and horns in the grand manner. Buster turned Ben E. King's original light uptown lament from 1960 (Atco 6207) into a gospel-chorded masterpiece and scored heavily with the disc in places like Baltimore, Cleveland and Washington DC. Eichner clearly preferred his own productions on Buster to everyone else's as the flips to both 45s came from his original studio work, "I'm So Lonely" and "You Were Meant For Me". None of Busters 45s made the national charts but his enormous talent and adequate regional sales prompted Jubilee to stay with him for 5 years. At the time the company folded they were about to collect much of his work on to an album. The running order and artwork were completed and there have been persistent rumours that promo copies were pressed and Buster himself recalls owning a copy on 8-track but I've never seen one on any format. 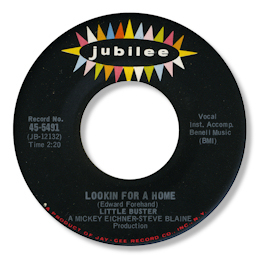 During his tenure at Jubilee Buster recorded several numbers that remained unissued until they were included on the UK Sequel CD “Looking For A Home”. Most of them came from the first recording date, and several of them featured his talent show partner Henrietta Buchanan. She had a pleasant if unremarkable voice with an obvious background in gospel music. "He's Gone" is another song from that soul sub-genre, the Vietnam lament, but it's overshadowed by the two duets with Buster. The charming "Why Did It Have To Be Me" taken at a dead slow pace was particularly appealing thanks to the arpeggio styled backing. "I've Got Tears In My Eyes" has much the same engaging naivete as Mickey and Sylvia's late 50s numbers and strikes much the same emotions. Due to the simplicity of the backing this must sound very similar to the way it was performed when they won the amateur prize that night in Harlem. For whatever reason Eichner and Blaine did not go with any of Henrietta's numbers and she does not appear to have done any further recording. 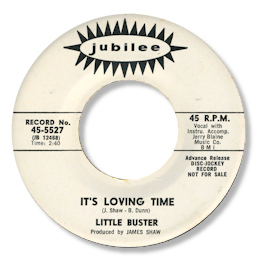 Of the Little Buster solo numbers, several follow the pattern of his early 45s. "What A Fool I've Been" for example, is another evocative vocal and the more tender "I Love You Yes I Do" is a beautifully realised performance. But the best of these numbers are undoubtedly "I Proved I Loved You" with it's Latin tinge and wonderful bluesy guitar fills and “Cry Me A River". This features some marvellous organ touches from Buster himself, and was his first recording of this blues. Despite their lack of orchestration and production frills it would be quite wrong to consider these are merely demos. It is much to Eichner and Blaines credit that they recognised how effective Buster sounded in these uncluttered settings and were prepared to release finished cuts like that. The unreleased masters are well up to that standard. In August 1965 a further session was held. The outstanding two part version of Etta James' "All I Could Do Was Cry" features another gritty emotional vocal and lengthy rap on the second part, in the same manner as Joe Tex's version for Anna but with a much harder edge. The other cuts took Buster in a new direction completely. Both "Just A Letter" and "Any Day Love Walks In" were uptown soul, big city productions with a lull orchestra, similar to the things producers like Bert Berns were doing elsewhere in the Big Apple. Buster's vocal styling is softer and more restrained than hitherto in keeping with the intended effect. The other song from this session was "Whole Lotta Lovin'" in which Buster updates Fats Domino's Crescent City shuffler into a rousing soul dancer with a super axe solo. Heaven knows why it was never issued. 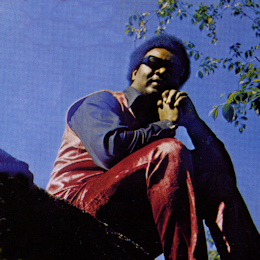 In 1969 Buster had his final single issued under the direction of George Butler and veteran arranger Horace Ott. "City Of Blues" (Minit 32076) is a tuneful uptown ballad with large orchestration above which Buster just manages to keep his head. The B side was a second cut of the blues ballad "Cry Me A River" arranged with a hint of funk. Sadly the other two cuts recorded at the same time have never appeared. And that was Little Busters recording career for 25 years. He kept plugging away in the Big Apple during 70s and 80s, gradually introducing more bluesy material into his repertoire, until with the revival of revival of interested in real music over the last few years he was rediscovered by Bullseye. And to the joy and surprise of all soul fans the result was the excellent "Right On Time" CD, arguably the best new release of that year. Every home should have a copy. This incorporated recuts of some material cut for a Long Island investor in '85 but not issued and featured his own Soul Brothers band. They were still a good draw in the Big Apple and by all accounts gave a cracking live show allowing full rein to Buster's impressive showmanship. The band were captured for a final time on the 2000 CD “Work Your Show” on Fedora. This more bluesy set was another unmissable one full of Buster’s gritty vocals, so full of emotional strength. In 2004 Forehand suffered a series of strokes, and these sadly led to his death a couple of years later. And one of the last great artists upholding the traditional soul/blues style was gone. UPDATE ~ Adam Sutherland writes to say he has a copy of the original Little Buster Jubilee album as an 8-track. This may be the only format it ever appeared on. I'm grateful to Adam for the info. Thanks to Dave Turner for the suggestion.